CANBERRA, Australia, Feb. 13, 2017 /PRNewswire/ -- Global Navigation Satellite System (GNSS) signals are critical tools for industries requiring exact precision and high confidence. Now, Geoscience Australia, an agency of the Commonwealth of Australia, and Lockheed Martin (NYSE:LMT) have entered into a collaborative research project to show how augmenting signals from multiple GNSS constellations can enhance positioning, navigation, and timing for a range of applications. This innovative research project aims to demonstrate how a second-generation Satellite-Based Augmentation System (SBAS) testbed can – for the first time – use signals from both the Global Positioning System (GPS) and the Galileo constellation, and dual frequencies, to achieve even greater GNSS integrity and accuracy. Over two years, the testbed will validate applications in nine industry sectors: agriculture, aviation, construction, maritime, mining, rail, road, spatial, and utilities. "Many industries rely on GNSS signals for accurate, safe navigation. Users must be confident in the position solutions calculated by GNSS receivers. The term 'integrity' defines the confidence in the position solutions provided by GNSS," explained Lockheed Martin Australia and New Zealand Chief Executive Vince Di Pietro. "Industries where safety-of-life navigation is crucial want assured GNSS integrity." Ultimately, the second-generation SBAS testbed will broaden understanding of how this technology can benefit safety, productivity, efficiency and innovation in Australia's industrial and research sectors. "We are excited to have an opportunity to work with Geoscience Australia and Australian industry to demonstrate the best possible GNSS performance and proud that Australia will be leading the way to enhance space-based navigation and industry safety," Di Pietro added. Basic GNSS signals are accurate enough for many civil positioning, navigation and timing users. However, these signals require augmentation to meet higher safety-of-life navigation requirements. The second-generation SBAS will mitigate that issue. Once the SBAS testbed is operational, basic GNSS signals will be monitored by widely-distributed reference stations operated by Geoscience Australia. An SBAS testbed master station, installed by teammate GMV, of Spain, will collect that reference station data, compute corrections and integrity bounds for each GNSS satellite signal, and generate augmentation messages. "A Lockheed Martin uplink antenna at Uralla, New South Wales will send these augmentation messages to an SBAS payload hosted aboard a geostationary Earth orbit satellite, owned by Inmarsat," explains Rod Drury, Director, International Strategy and Business Development for Lockheed Martin Space Systems Company. "This satellite rebroadcasts the augmentation messages containing corrections and integrity data to the end users. The whole process takes less than six seconds." 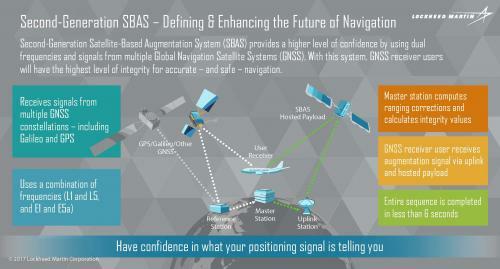 By augmenting signals from multiple GNSS constellations – both Galileo and GPS – second-generation SBAS is not dependent on just one GNSS. It will also use signals on two frequencies – the L1 and L5 GPS signals, and their companion E1 and E5a Galileo signals – to provide integrity data and enhanced accuracy for industries that need it the most. Partners in this collaborative research project include the government of Australia. Lockheed Martin will provide systems integration expertise in addition to the Uralla radio frequency uplink. GMV-Spain will provide their 'magicGNSS' processors. Inmarsat will provide the navigation payload hosted on the 4F1 geostationary satellite. The Australia and New Zealand Cooperative Research Centre for Spatial Information will coordinate the demonstrator projects that test the SBAS infrastructure. Lockheed Martin has significant experience with space-based navigation systems. The company developed and produced 20 GPS IIR and IIR-M satellites. It also maintains the GPS Architecture Evolution Plan ground control system, which operates the entire 31-satellite constellation. For additional GPS information, photos and video visit: www.lockheedmartin.com/gps.